On October 21, 1956, Archbishop Joseph P. Hurley of Saint Augustine sent Fr. Joseph O’Shea to Palmetto as the Administrator of the first Catholic church to be built in Manatee County. On that day, Mass was celebrated at the Palmetto Women’s Club, and the Holy Cross Mission was born. Shortly after his arrival, Fr. O’Shea began a building campaign for the church. The diocese procured fifteen acres of land in December 1956, one mile north of Palmetto on US Highway 41. Fr. O’Shea served the 100 Catholic families of the Holy Cross Mission until March, 1957, when Fr. James C. Fahey became the new Administrator. Ground was broken for the new mission church on June 8, 1958 and the first Mass was celebrated in the church by Fr. Fahey on November 30, 1958. Dedication of the Holy Cross Mission Church by Archbishop Hurley took place on December 12, 1958. From 1959 to 1960, Fr. Frank Goodman served as Administrator. During this time, the parish purchased a used building and moved it to the church’s property to serve as a much-needed parish hall. St. Joseph Parish donated a one-story building with seven rooms, which was used as a rectory and offices for over twenty years. On February 16, 1960, Fr. Daniel Carrigan was appointed Pastor of the new Holy Cross Parish. Because of Fr. Carrigan’s declining health, Fr. Vincent Llaria was appointed Pastor on January 1, 1978. His main goal for the parish included a parish/social hall, a larger rectory, and a new church. On January 19, 1980, the fund drive began for a social hall, and on August 3, 1980, the parish hall groundbreaking took place. The new, five-bedroom rectory was completed June 22, 1984. Finally, the kickoff for the new church was held in March 1986, followed by the ground-breaking on April 9, 1988 by Bishop John J. Nevins. The first Mass and the dedication were celebrated in the 1,300-seat church on December 3, 1989, officiated by Bishop Nevins. In 2003, the parish hall was renovated and the Holy Cross Garden of Peace (Memorial Garden) was established. The old church became the Religious Education building and was named for Fr. Llaria. On December 16, 2007, Bishop Frank J. Dewane presided over a mass at the parish followed by the dedication of the Holy Cross Circle of Honor and the blessing of the circle garden of four flags. On April 23, 2003, Father Teofilo Useche was appointed Administrator of Holy Cross Parish. Fr. Useche was appointed pastor of Holy Cross on May 1, 2005. In 2008, the parish community celebrated its 50th Anniversary. On January 11, 2011, Father Marcial Garcia was appointed Administrator of Holy Cross. 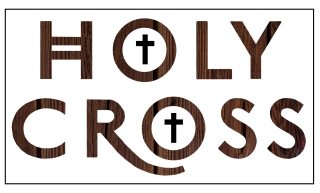 For a complete list of former pastors and priests who have served Holy Cross, click here.